I’ve never had aubergine before. Not once. I think that’s pretty impressive vegetable-dodging for a 32yr old even if I do say so myself! You see, I grew up in a family where the person in charge of the cooking hated aubergine… with a (not entirely normal) passion about it. As a marvellous curry cook, I think my Mum had tried to incorporate things like Aubergine and Okra many-a-time, always with a disappointing result. Aubergine does have a bit of a reputation too, doesn’t it? Slimy… bitter… some not-very-tantalising adjectives that make it quite easy to leave the poor vegetable sitting, unloved, on the supermarket shelf. Well, I got brave and finally had a go with this much-maligned veg. And you know what? It turned out pretty good! 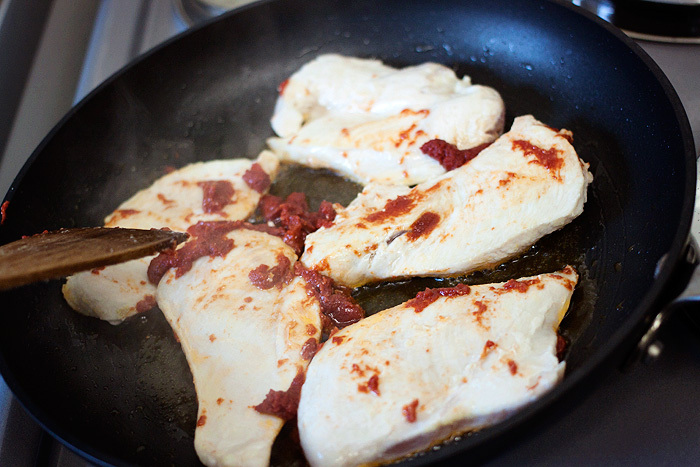 Fry off your chicken with the tomato puree and a few squirts of Frylight or a little oil. Don’t overcook as you’ll be putting the breast in the oven, just seal the pieces to release some of the juices and take off the heat. 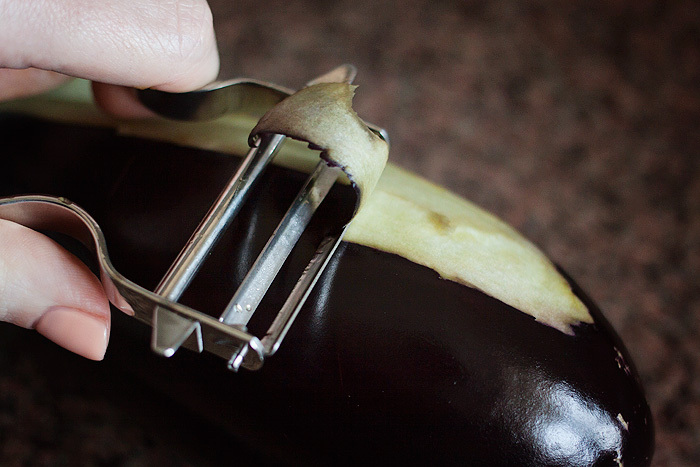 Start peeling your aubergine. 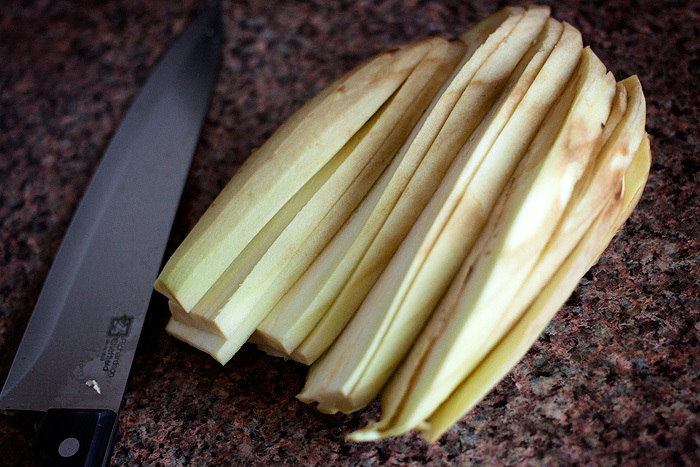 You don’t have to but mine were about a week old… the older the aubergine, the tougher the skin! 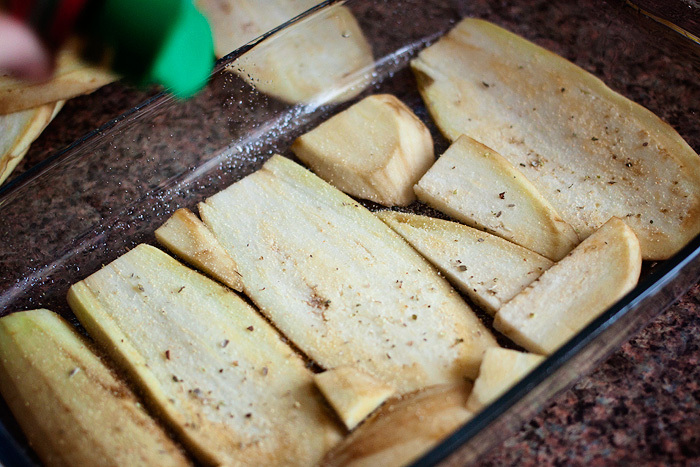 Spray a little Frylight into your baking dish and layer the aubergine slices across the bottom of the dish. 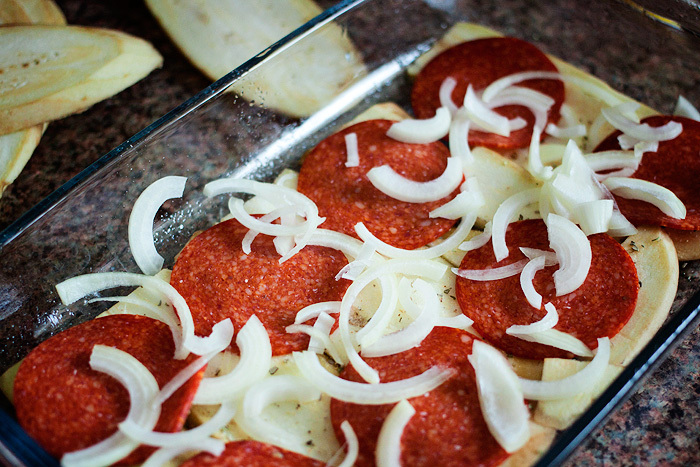 Sprinkle some garlic granules, salt (if you wish), and oregano over the top of the cut pieces. Lay the pepperoni across the aubergine – the fat that releases from the meat will soak into the vegetable and amp up the flavour in a big way! 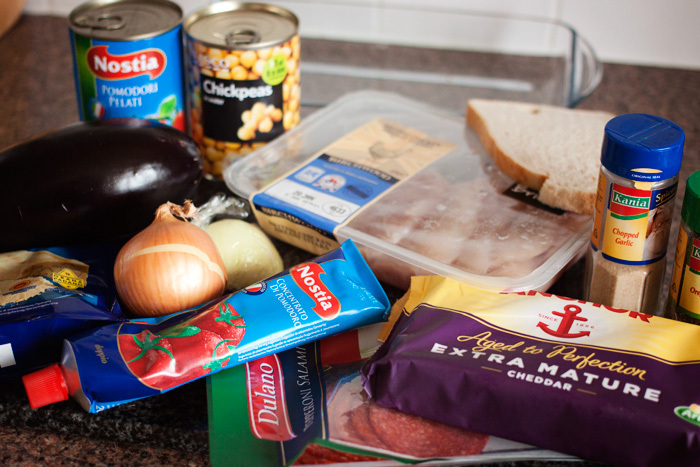 Scatter the chopped onions on top of this. 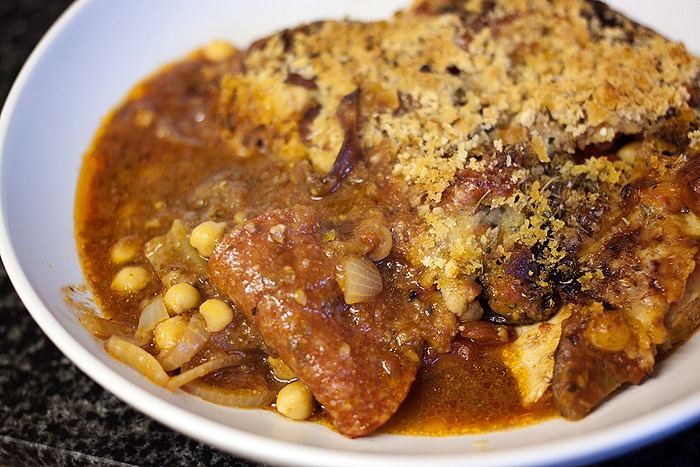 One of the nicest things about this meal is that (apart from frying off the chicken) it’s a one-pot dish. Very quick to assemble when you get home from work. 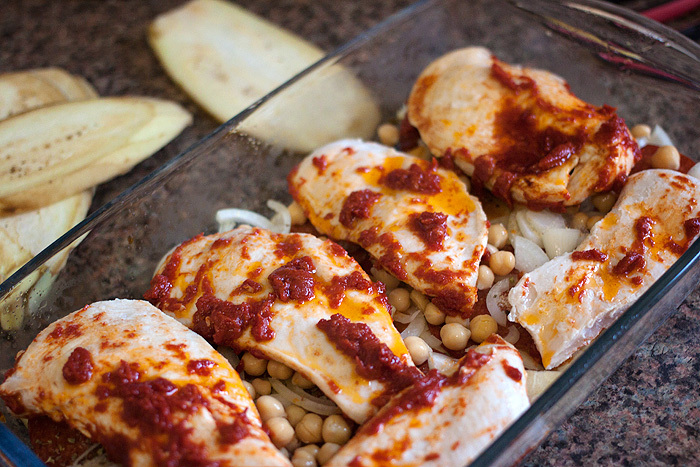 Add the drained chickpeas (I use about half the can here) and rest the chicken pieces over the top. Don’t skimp on the tomatoey/oily juices from the pan… the aubergine will thank you for all that flavour! Layer the remaining aubergine slices ontop of the chicken. 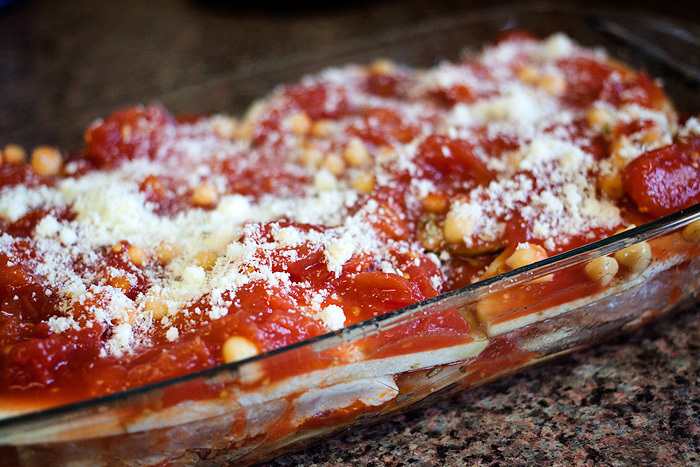 Finally, add your tinned tomatoes, the remaining chickpeas, Parmesan, and grated cheddar. If you like, you can add a splash of balsamic vinegar… whenever I use tinned tomatoes, I can’t help myself! If you haven’t already, now is the time to pulverize your slice of bread into crumbs. 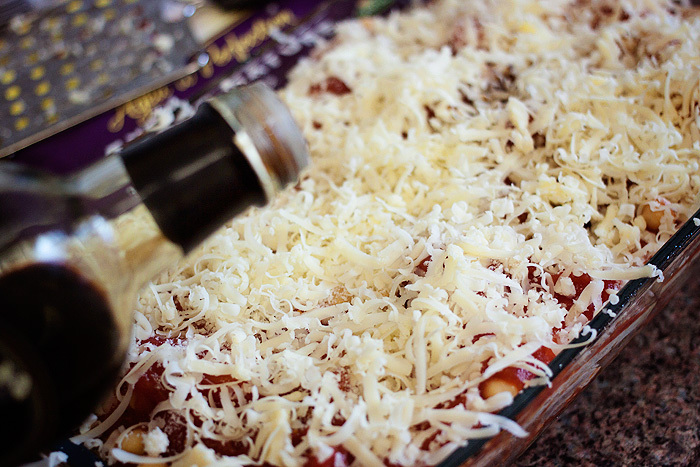 Sprinkle the bread crumbs over the cheese and bake in the center of the oven for 1hr, checking occasionally to make sure that the top doesn’t get too brown. You can serve this with some chunky, fresh bread or be good and have a side salad. 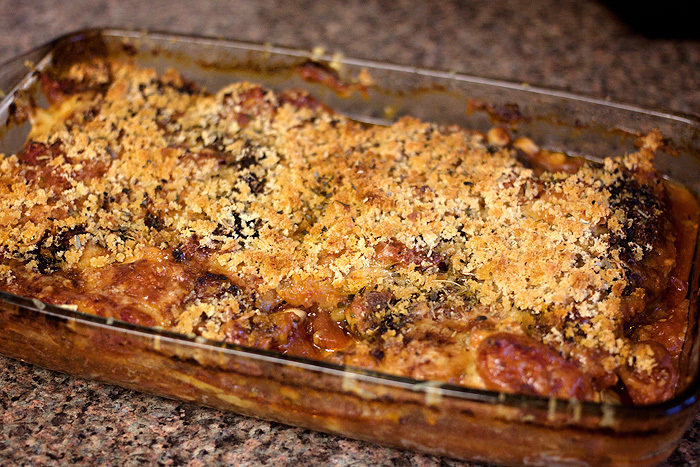 This Chicken & Aubergine Bake really makes for a quite a substantial and very filling meal! I probably used around 1Tbsp of oil in total. You could lose the pepperoni and of course, cut down on the cheese if you’re really watching your fat intake (although I don’t think there’s too much in this meal). For my blood sugars, I’ve found that a little bit of fat combined with some slow-release carbs actually helps prevent a post-meal spike, so I’m not overly concerned. Do you like aubergine? How do you eat it? 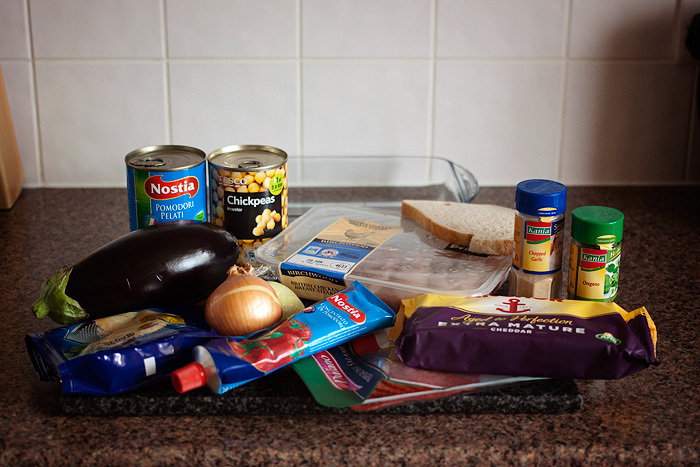 I love aubergine and use it on pretty much everything I cook (which I have to say, isn’t all that much lol).